Dramatic changes have taken place in the last decade with respect to the views of the American Jewish community toward Israel and Zionism. Since the beginning of the Second Intifada in 2000, the involvement of the Israel lobby in precipitating the Iraq War and promoting war on Iran, and Israel's widely condemned wars in Lebanon and Gaza, large swaths of the American Jewish community have been disenchanted with Israel and Zionism as at no other time since the founding of the State of Israel. However, anti-Zionism in America has a long history. Elmer Berger was undoubtedly the best-known Jewish anti-Zionist during most of his lifetime, particularly from World War II through the 1967 Six-Day War and its aftermath. 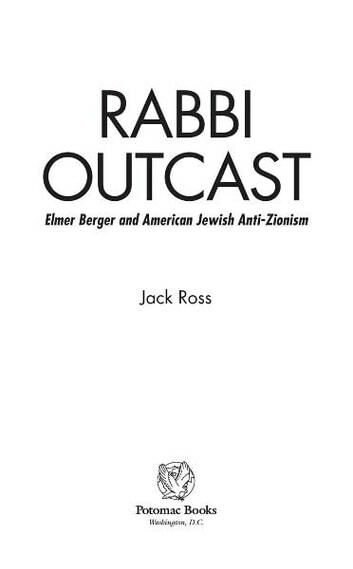 A Reform rabbi, Berger served throughout that period as the executive director of the American Council for Judaism, an anti-Zionist organization founded by leading Reform rabbis. 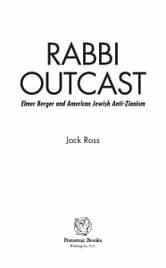 Author Jack Ross places liberal Jewish anti-Zionism (as opposed to that of Orthodox or revolutionary socialist Jews) in historical perspective. That brand of anti-Zionism was virtually embodied by Rabbi Berger and his predecessors in the Reform rabbinate. He advocated forcefully for his position, much to the chagrin of his Zionist detractors. The growing renaissance of liberal Jewish anti-Zionism, combined with the forgotten work of Rabbi Berger and the American Council for Judaism, makes a compelling case for revisiting his work in this full-length, definitive biography.